Posted on February 20, 2019 at 10:23 am. With the changing weather, your HVAC system needs to work properly to bring optimum comfort to your living space. But how could it be possible if its vital components are dirty? Filthy and poorly maintained parts like fan coil can reduce your system’s efficiency. It does not just contribute to the high operating cost but also reduces the lifespan of your HVAC system. 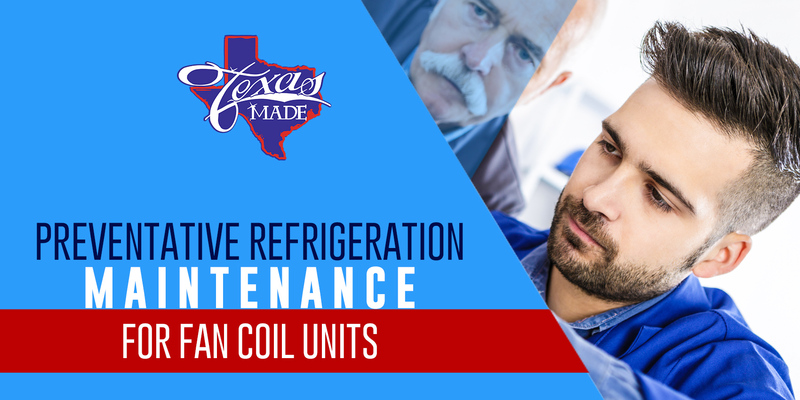 Our experts at Texas Made Air Conditioning and Heating explain why preventive refrigeration maintenance for your fan coil unit is important… so keep reading. Your fan coil is comprised of three main components: the filter, motor, and the coil itself. The way these components function has a significant impact on each other. For instance, if you forget to replace your air filter, the motor might strain beneath the weight of accumulated debris and dust. Also, failure to use a fuse with the exact voltage, type, and size might shut down the whole system. Inspection, cleaning, and making necessary repairs on each part of the unit is a tedious job. While cleaning your fan coil can be done easily through DIY efforts, some complex jobs might require professional attention. So, be sure to call the experts to resolve your fan coil issues. How Often Should You Perform HVAC Maintenance for Fan Coil? We also suggest doing the maintenance before or during the spring. This is the season when warmer weather starts to kick in, and your refrigeration system begins to work harder. By completing refrigeration maintenance for your fan coil, you can increase your system’s efficiency and save money on operating costs. To know your system’s optimal maintenance schedule, contact us at Texas Made Heating & Air Conditioning. Why Call Texas Made Heating & Air Conditioning? Our team can perform expert inspection, cleaning, and lubrication of your fan coil units. If other parts in your HVAC system need repair or replacement, we can do the job according to the manufacturer’s recommendation and restore your unit to maximum operating condition. We do fast and reliable services at the price you can afford. We even offer high-quality fan coils (if your unit needs replacement) and install it right away. Call us at Texas Made Heating & Air Conditioning to get started.